The eagerly-anticipated latest novel by Singapore's bestselling author Eliza Teoh. 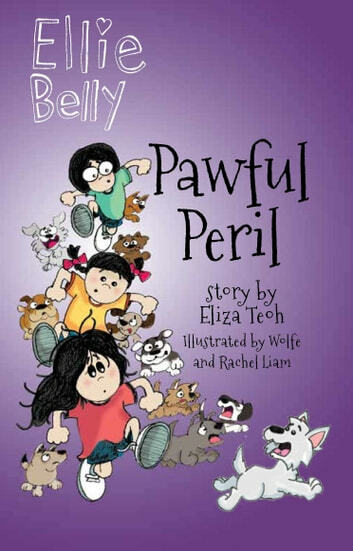 In her seventh book, Ellie Belly faces her most heart-wrenching animal rescue ever, but not without her typical cheekiness and hysterical antics. Ellie finds out from Snowy about dogs stuck on a puppy farm with no food! She needs to find the farm, buy lots of doggie food and get it to the dogs. But she’s supposed to be in bed... sick! Are the dogs doomed? How is she going to explain to Mama? Can she get out of this doggie disaster? Each Ellie Belly book is peppered with fun facts about animals, light-hearted vocabulary tips and hilarious diary pages. Much loved by children and applauded by Singapore's world-class educators, the Ellie Belly series is a rollicking read for both adults and children alike. Recommended for children aged 6-10 years and as a fun read-aloud with younger ones.